Want to try to program with the Minecraft Pi API but with the full version of Minecraft? RaspberryJuice implements the Minecraft Pi modding API for Bukkit servers. The plugin listens on port 4711, and accept most of the Minecraft Pi commands, which are documented at http://wiki.vg/Minecraft_Pi_Protocol . The plugin supports the majority of the api's supplied with the Pi edition and most examples will work. 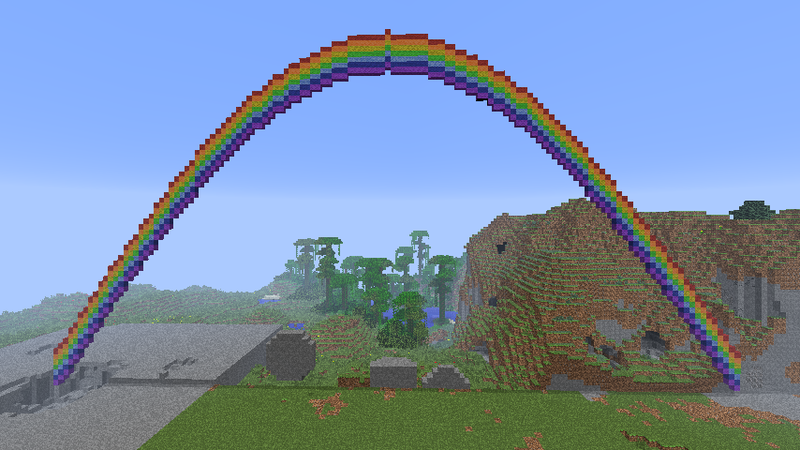 This Python script builds a rainbow near the spawn. Place this example in the api/python directory of the Minecraft Pi prerelease, start the server on the same computer, and run python name.py to run, replacing name.py with the actual name of the script. Why on Windows 10 64 Bits can't work? Can you make Commands with this Plugin? Like /spawn or /home. Hello. Been dreaming about this for years. Does it support if-else-break operators? Do I have to install actual Python? Hi, do you have any more information? What do you mean doesnt work? Do you get errors when launching bukkit? Or do you mean you cant download Bukkit? - because that is a different problem and nothing to do with RaspberryJuice. This does not work! i am using 1.6.4 and i tried to download it still nothing! HELP! Just got this working with Python 3.7, Minecraft 1.13.2 Java Edition, spigot mc server on windows 10. Many thanks Dave, much appreciated, will give that a whirl. Perhaps I'm missing something obvious, but if I use player.getTilePos() the values returned don't match the Minecraft X,Y,Z coordinates like the do on the Pi. Hey! Awesome work! I owe you guys a beer! I am working with some friends for Kids Hack Day and one of our programs is to teach kids how to program with Minecraft. We are using right now Raspberry Pi but it's quite frustrating for them to go home and not being able to practice what they learned. We will run a Game Development program inside Minecraft from middle of October to December and definitely we'll user your plugin to enable the littles to keep programming after the classes. One thing we are working right now is an abstraction (almost a game engine) to build mini-games inside Minecraft. Hide and seek, capture the flag, sokoban, treasure hunt and many other examples are on our scope. I noticed that you only exposed one type of events, even Bukkit expose more than that, are you guys planning to expose them entirely? Would be possible to us to contribute on your roadmap by developing or suggesting features? Since now, thank you very much for your work, it's really inspirational! Its mainly bug fixes but it does include the ability to change the TCP port by modding the config.yml. If you have any more info about the issues you having could you add them to the issue? What commands did you want to add? It would need a change to the plugin, but if you have any ideas it would good to hear them. Does this work with any version past 1.4.7? And if not, any chance of updating it? I love using the Pi version of MC and'd love to have this on my server.